Few small cigar brands begin with a mild smoke. Sure, the potential audience is larger than that for the powerhouse blends often favored by boutique firms. But it also involves going up against industry behemoths such as Macanudo, Romeo y Julieta, and Montecristo. Búho Cigars, run by the father and son team of Eddie and Ryan Dovner in Florida, kicked off at the low-end of the spectrum with a Dominican-rolled line featuring an Ecuadorian Connecticut wrapper, an Indonesian binder, and “a proprietary Dominican blend” for filler. Búho (“owl” in Spanish) is experimenting with different packaging options. In addition to conventional boxes of 20, sampler packs are available in durable humidified travel cases. The company is also promoting point-of-purchase displays with individual cigars in sealed humidity packs. Cigars for this review were supplied by Búho, which also sent some we’re giving away in a StogieGuys.com contest. (Details toward the end.) 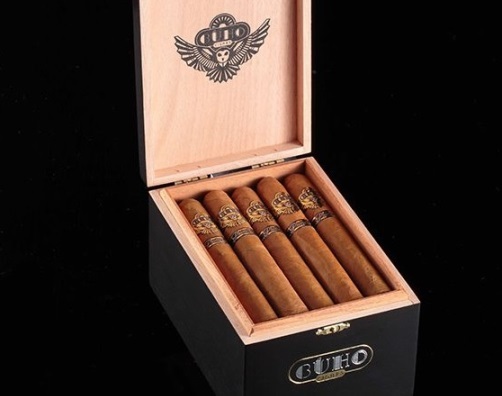 Suggested retail prices for Búho cigars are $8 to $9. I have smoked three in the Robusto format (5 x 50), and, other than a bit of a tight draw on one, construction was good. They burned straight and slow, producing a great deal of creamy smoke. The opening is typical of many Connecticut cigars: a little grass, a little hay, a touch of earth, a bit of a bite. Within half an inch or so, though, a rich tobacco sweetness begins to emerge and overlays other flavors, including some light spice along the way. The cigar shines best in the second half. Now, here’s the contest. For a chance to win a sampler of Búho cigars, simply go to Búho’s Facebook page, like it, and visit Búho’s website and register. Then leave a comment on this post that you’ve done so. We’ll pick two winners at random in a week or so. And I think the winners will enjoy these smokes, especially if they’re partial to Connecticuts. Búho is well worth trying. I rate the Robusto three and a half stogies out of five. Always good to read a review about a cigar that’s new to me. Thanks! And, thanks for the contest. Thanks for the opportunity! Would be wonderful to try and share with a friend who is new to smoking cigars! Great review and contest. Thanks! Good review as always, and I registered on their site! Great review. Looks like a nice stick. Thanks for the chance to win this contest. Thanks for the contest. Just linked up with Buho on Facebook. Liked page and registered. Thanks for the contest. Can’t wait to try one! Registered for contest. I tried 3 of these cigars and all 3 were bad. After letting them know they realized there was a humidity problem. They did fix the problem and offered to send more but I never did get them. Thanks for the opportunity! Can’t wait to win! Done and done – thank you! I have both “Like” the Búho Cigars Facebook page and registered at the Búho Cigars website for my entry within this giveaway. Liked the Buho Facebook page and registered on their site. Thanks! Liked and registered!! Looking forward to giving these a try! Registered for the contest! Looking forward to these. Done and Done, thank you for the opportunity! Thanks for the review and the contest guys! Liked and registered. Plenty of room in the humidor for a sampler. Thanks so much for the chance. Liked and registered. Thank you guys. I’ve liked and registered. Please enter me to WIN! Liked and registered, can’t wait to enjoy one of these stogies! The only thing I like better than your reviews is smoking the cigars. The Plasencia family has been growing tobacco, and producing cigars, for five generations. The family’s roots go back to Cuba.